Spring has sprung and all throughout yogaland, studios are hosting “detox flow” workshops that emphasize deep twists and side bends. 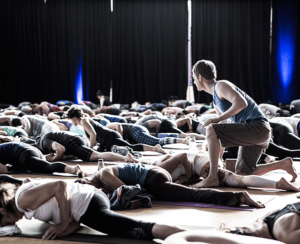 And, no doubt, the vast majority of these workshops will declare that you need to keep your pelvis “stable” when you twist in order to keep your lower back and sacroiliac joints safe. Although the word “stable” in this context is slightly misleading, teachers are trying to keep their students from turning their pelvis when they rotate their spine. This is the way I taught twists for over 15 years — adamantly no less. This is the point in the narrative where I tell you that I’ve changed my tune. I no longer think that the pelvis needs to stay fixed when the spine rotates. In fact, I prefer to allow my pelvis to rotate a little bit in the direction that my spine is twisting. This means that when I’m twisting to the right, I allow my pelvis to rotate slightly to the right. I know, I know — I don’t like change either. And, keeping the pelvis fixed has been the conventional wisdom in yoga for a while. But, hear me out while I make a few points. The first thing to consider is that your pelvis and spine work best when they work together. Technically, the spine starts on top of the pelvis. But, in reality the spine and pelvis are structurally merged via the sacrum and coccyx — not to mention all the ligaments, tendons, and other soft tissues that bind the spine and the pelvis together. Moving your spine and pelvis together in an integrated, cohesive way is one of the most effective ways to minimize injuries since cohesive motion distributes the mechanical stresses of yoga postures. Too much concentrated stress in the sacro-lumbar and sacroilliac regions is more likely to create injuries than stresses that are more evenly distributed. This means that if you don’t let your pelvis rotate in the direction that your spine is rotating, you are more likely to concentrate stress in the sacro-lumber and sacro-illiac region. This doesn’t mean that you can’t move the spine independently. You can. It simply means that the spine and pelvis should be on the same page. The pelvis should be doing at least a little bit of what the spine is doing, especially in demanding postures. The second point to consider: Look at the relationship between your pelvis and spine in your forward bends and backbends. 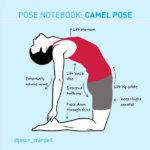 Do you inhibit the pelvis from moving in these postures, or do you move the pelvis and spine together in these postures? Chances are you initiate your forward bends and backbends by rotating your pelvis and spine simultaneously. In fact, if you did forward bends and backbends and you kept your pelvis fixed, you wouldn’t go very far and you’d create an enormous amount of undesirable stress on your lumbar. It’s the same when you twist. The last two points are simple and telling. First, when you allow your pelvis to rotate slightly when you twist, you’ll probably move and breathe more freely. Second, when I talk to my students and colleagues that are physical therapists and orthopedists, they agree that allowing the pelvis to rotate in the direction the spine is twisting makes more sense than not allowing the pelvis to rotate at all. Now, again, I’m going to flip the script a little. I don’t want to say that rotating the pelvis with the spine is the new, singular gospel that every yogi should follow every time they practice. Rather, I want to dispel the notion that keeping your pelvis fixed while twisting is inherently safer, more stable, or more dynamic because it’s not. Finally, I want acknowledge that after years and years and years of teaching postures one way, I changed my mind. All yoga teachers should afford themselves this right so that we continue to question our own assumptions. 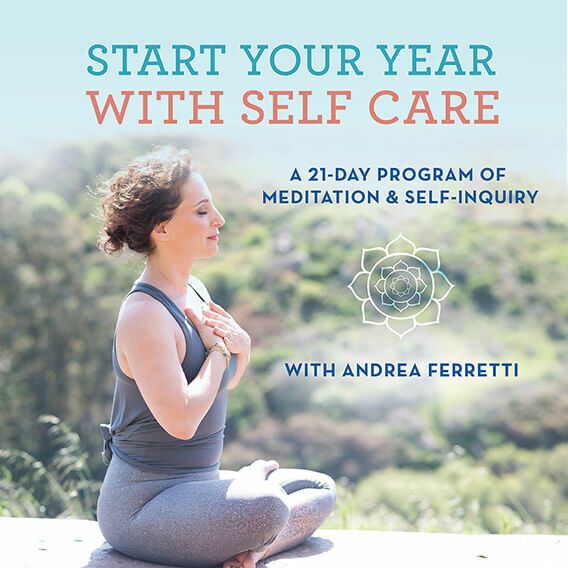 And, I want to give you a few postures to try so that YOU, yes, YOU, can determine the different ways that these two options feel in your body. So, get your mat out, do a few hip openers to mobilize your hips and experiment with the following four twists. In the first phase of each posture, you’ll keep your pelvis fixed. In the second phase of each posture, you’ll allow your pelvis to rotate in the direction that you’re twisting. Take a few breaths in each posture and tune into the sensations of your entire body. Phase 1: Keep both knees in the same plane. This is the easiest way to assure that your hips are fixed (not rotating). Phase 2: Allow the knee that you’re rotating away from to slide slightly forward. This allows your pelvis to turn into the twist slightly. Phase 1: Place your hand on the back of your pelvis. Keep both hips level with each other. This will ensure that your pelvis is not rotating when your spine is rotating. Phase 2: Keep your hand on the back of your pelvis and allow your pelvis to rotate in the direction that your spine is rotating. The hip on the side that you’re rotating toward will raise slightly. The hip that you’re rotating away from will slightly lower. Phase 1: Sit with both hips equidistant to the front of your mat. Bend your right knee, draw your right heel toward your sitting bone and rotate to your spine to the right in marichyasana 3. Phase 2: Begin with both of your hips equidistant to the front of your mat. Bend your right knee and draw your heel toward your sitting bone. Then, slide your left leg and left hip an inch or two further forward. This will rotate your pelvis slightly toward the right. Rotate your spine to the right to and do Marichyasana 3. When I practice difficult postures I have to be strategic. 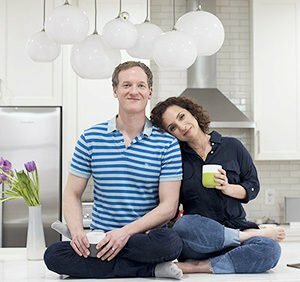 Since I don’t have the natural flexibility or raw strength to will myself into advanced postures like Eka Pada Koundinyasana, I have to emphasize preparation, efficient leverage, and technique. For me, this means breaking down difficult postures into small, accessible components. 1. What are the legs and hips doing in the pose? 2. What are the core and spine doing in the pose? 3. What are the shoulders and arms doing in the pose? It’s a simple, straightforward process that helps me — and can help you — take a complex pose and boil it down into manageable parts. One benefit of this process is that it provides you with aspects of every posture that you can work on even if you can’t do a particular pose in its’ entirety. When I apply these questions to Eka Pada Koundinyasana I, I get simple, straightforward answers. The hips, legs, spine, and core are in Parivrrta Trikonasana The shoulders and arms are in Chaturanga. In other words, Eka Pada Koundinyasana I, is Revolved Triangle Pose on top of Chaturanga. 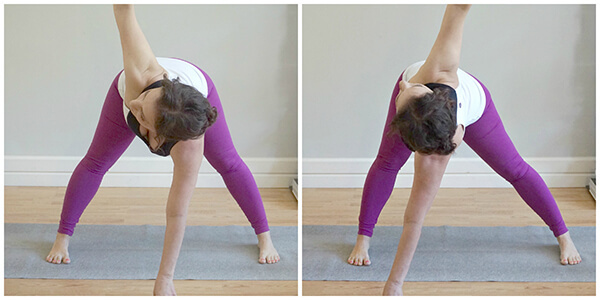 So, this sequence focuses on preparing for a deep Revolved Triangle Pose and a strong Chaturanga. The first three postures will wake up your core. More specifically, the 2nd and 3rd postures in the sequence will fire-up your obliques since they include a demanding twist. These postures set the tone for the sequence by providing you with a preview of the postures and actions that will follow. The 4th posture, Downward Facing Dog, gives you a smooth transition from the reclined postures to the hip-opening lunges. Admittedly, the hamstrings and adductors—which are focused on in pose #5—are not huge components of Eka Pada Koundinyasana. 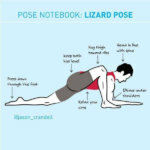 But, those of you with tight hamstrings will benefit from the inclusion of lizard pose, since it will prepare you for Revolved Triangle and Revolved Half Moon. Practicing Pigeon Pose will prepare you for the upcoming twists by creating more mobility in your outer hips and IT bands. Poses 7 through 10 give you a straightforward progression of standing twists. Each twist builds on the previous twist as the progression slowly increases in demand. These postures prepare your outer hips, IT bands, and spine for the demands of Eka Pada Koundinyasana. The 11th pose, Revolved Utkatasana, provides you with a standing twist that closely resembles the next posture in the sequence—Side Crow, or Parsva Bakasana. Parsva Bakasana is the foundation for all arm balances that include a twist. 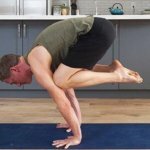 When you develop the strength, flexibility and overall coordination to do this pose proficiently, you’re also setting the stage for other twisting variations. 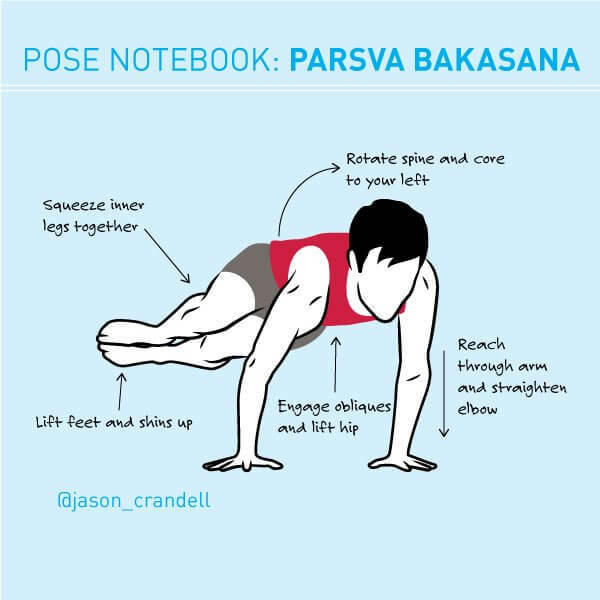 Also, Parsva Bakasana is a great pose for transitioning into Eka Pada Koudinyasana.